A member of the Leading Small Hotels of the World, the Waldhaus Flims dates to 1877, making it the oldest and grandest of the three hotels (the others are the Hotel Belmont and Villa Silvana) grouped around a pavilion in a parklike setting in the Swiss Alps, 137 km (85 miles) southeast of Zurich. Covered walkways and underground passages connect the four structures and a collection of amenities, including a spa, curling hall, restaurants and bars, a petting zoo, a museum, and a kids camp. Tennis consists of two outdoor red-clay courts. 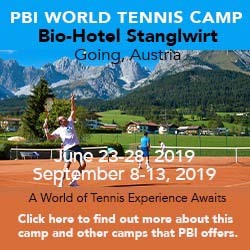 Peter Burwash International staffs the summer program (mid June-mid September), offering game matching, clinics, and a free 30-minute hitting session with the pro as well as private lessons. There are three hotels on property: The Waldhaus Grand Hotel, the Hotel Belmont, and Villa Silvana. The following ranges of rates across the three options are for double rooms and various-sized suites and include daily breakfast. Single occupancy rates are also available, as is half-board. Prices quoted in Swiss francs (CHF). So far, I haven't received any written feedback on Waldhaus Flims Mountain Resort & Spa. If you've taken a tennis vacation there, I'd like to hear your reactions.